Last week I ventured across the rolling countryside of Scotland, in a train record of 35 minutes (although the train beers I had may have sped things up), all to find myself in the foreign lands of Glasgow! After an evening of celebrating that old Burns man with some friends, I woke up and decided to hang around for a bit, catch the sites and shoot the breeze. The said breeze, however, was more like a whirlwind of torrential rain and non-stop snow, therefore, without further ado i headed to a whisky bar. The bar of choice? 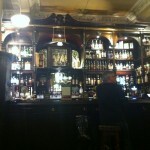 The Pot Still, one of Glasgow’s most iconic and interesting bars. A little history before I begin. 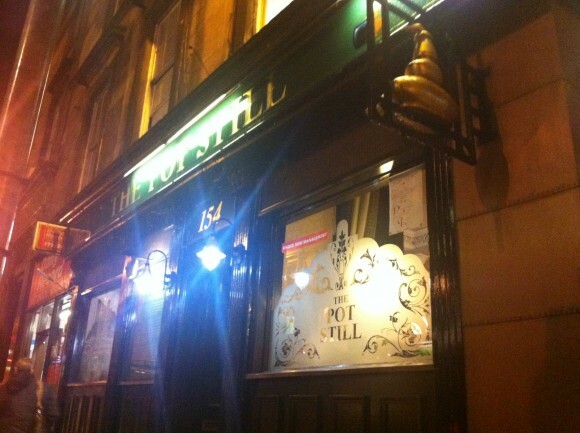 Located just a stone’s throw from Buchanan Street shopping, theatres, cinemas and plenty of fine, fine restaurants, the Pot Still has a fantastically central location that invites folk from all walks of life. The building itself, located on Hope street, has always been involved in the spirit and wine industry with previous tenants being merchants or the famous McCall family who ran a public house there from 1870 to 1981. It was then transferred to John Waterson who altered the premises and created the iconic Pot Still feel, whilst also adding the selection that has remained to this day. As I am blown in to the pub, damp, cold and drained, my spirits are lifted by the sight of the… well… spirits, behind the bar. 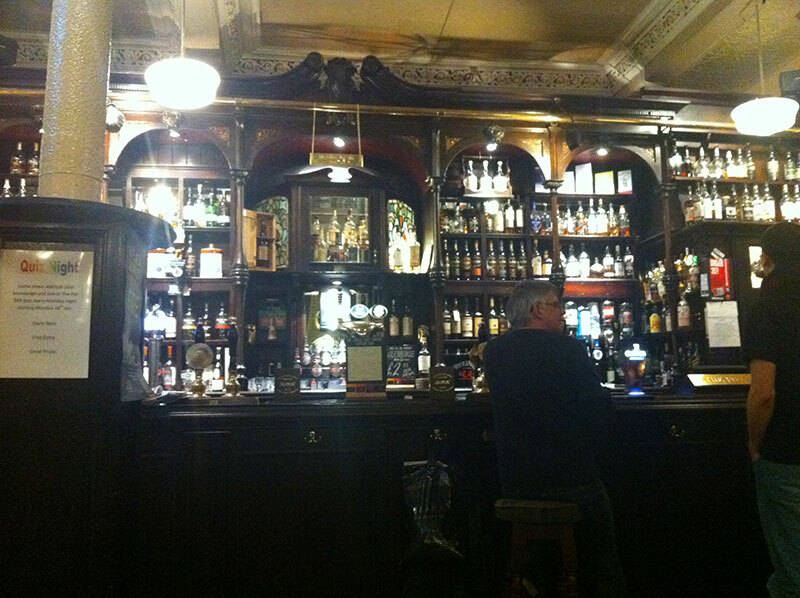 The Pot Still is home to about 300 whiskies mainly from Scotland but with a good international selection as well. The decor is simple and traditional, and set out around the bar are old style wooden benches and tables with an elevated second level at the back. There is whisky memorabilia scattered around the room and lovely pictures adorning the walls. This is all set out in front of the bar, where the height and lay out of the whiskies resemble an old, classic library. Delightful! As the day wears on the variety of people that enter changes as well; the traditional punters, the wandering drunks, inquisitive tourists and even a couple on a first date. It manages to obtain a friendly, traditional atmoshphere and even when pretty busy it continues to be relaxing and calming - despite the whirling maelstrom of snow outside. I have to admit after meandering around in the snow for a few chilly hours, I was content to plonk myself down with a Guinness in one hand and a choice whisky in the other. 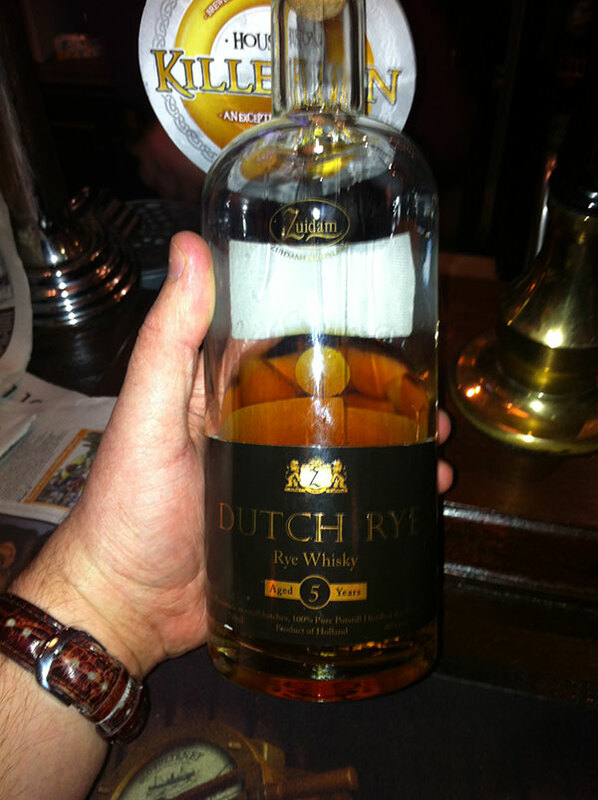 The barman was friendly, knowledgable and more than happy to help me choose the dram of the moment. I tried two on this fine winter’s day; an Arran 100 proof and a very intriguing 5yo Dutch rye whisky from the Zuidam family at Millstone distillery, the tasting notes are below. The overall atmosphere in the Pot Still is fantastic and definitely something that traditional whisky bars should strive for. If you ever find yourself in the centre of Glasgow and fancy a dram, traditional food or even just an escape from the rain, I highly recommend a trip here. Nose: Strong, intense floral notes. Very fresh and a mild caramel hint. A lingering medicinal note. Taste: Really fiery beast! It feels alive, sizzling over the tongue and bouncing around the mouth. The flavour itself is surprisingly delicate. Nice sweet candied pineapple and delicate toffee apple. Popping candy springs to mind. Finish: Disappears fairly quickly. Leaves a gentle, warming sweetness in the mouth. Nose: Personally I love the smell of Rye whisky! Very vibrant and fresh. Sweet candy notes, rich and complex toffee and an overall edge of mixed spice. Quite Dry as well. Taste: Not as fiery fiery fresh as the nose suggested. A little bit dry and rusty. Not much of the earlier freshness, or spice. An odd mix with a smattering of both hard toffee candy and cumin-roasted sweet potato. Not bad in the slightest, but nothing to overly excite the palate. Finish: Lingering and brings out the sweet notes of the spirit. Improves as it goes on but loses most of the spicy rye notes. 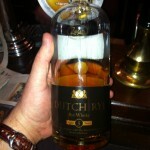 This entry was posted	on Wednesday, February 1st, 2012 at 11:10 pm	and is filed under Whisky Bars. You can follow any responses to this entry through the RSS 2.0 feed. Responses are currently closed, but you can trackback from your own site.